The kitchen is a central part of your home — where meals are prepared and often shared. But it can also be a very dangerous place for babies and toddlers. Whether you have a baby on the way or a curious toddler, read our kitchen baby-proofing tips to make sure your kitchen is kid-safe! Baby-proofing your kitchen doesn’t have to be a production, but it’s a must-do and you should carefully consider all of the potential hazards to your baby or toddler. Judith Schuler, co-author of Your Pregnancy Week by Week, walks us through the kitchen and offers the following tips for baby proofing the kitchen. First and foremost, ensure that all appliance cords are up and out of your child’s reach. If you can unplug the appliance and put it away when not in use, Schuler suggests doing so. That’s the best way to eliminate the danger. 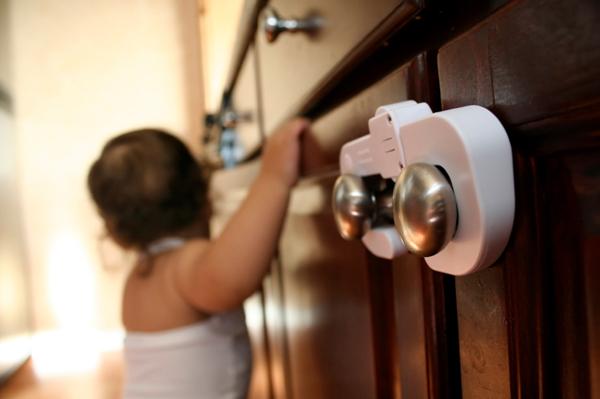 Cabinet locks are obvious when baby-proofing your kitchen. Installing cabinet locks is probably one of the first things most parents or parents-to-be consider. However, Schuler notes the importance of buying quality locks that your little one won’t be able to break or open on his own once he’s a bit older. She recommends checking Consumer Reports for the best brands. If your stove knobs are within baby’s reach, be sure to cover them. You can specifically purchase stove-knob covers. Additionally, pantry doors should have doorknob covers. What your little one sees as a snack can actually be a choking hazard. Schuler notes the importance of keeping knives, scissors and other sharp kitchen tools in higher cabinets. Silverware drawers that cannot be latched should be free of anything sharp that could harm your little one. Many people don’t give much thought to their kitchen junk drawer, but it’s often full of dangerous objects and therefore must be baby-proofed. Schuler lists several items that should be out of your little one’s reach — toothpicks, rubber bands and twist ties present a choking hazard, for example. Matches and lighters should never be accessible. Glue and all other adhesives can also be very dangerous. The following items are on Schuler’s danger list. Don’t forget them when baby-proofing the kitchen! Refrigerator magnets: Magnets can pose both a choking and intestinal hazard. Trashcan: Kids love to dumpster-dive! Trashcans can contain dangerous sharp objects, such as can lids, small objects babies can choke on and trash that is just plain gross. Pet food and water dishes: Babies can drown in one inch of water. Plastic grocery sacks: Always keep these safely out of reach. Better yet, don’t use them at all!